this corner of Sardinia, its sea and its history. Among the islands which dot the coast of Sardinia, the largest is Sant’Antioco, situated on the south-western coast, some 90 km from Cagliari. This is a territory very rich in history and culture, with numerous testimonials dating back to Phoenician-Punic times. The Lu’ Hotel Maladroxia is just 7 km from the town of S. Antioco, and faces on to the beach of “Maladroxia”, from which it takes its name. Calasetta is distant some 17 km; from there, visitors can reach Carloforte (Island of San Pietro) with a boat crossing lasting about 20 minutes. Surrounded by lush natural plant growth, the Hotel is on the outskirts of the town and looks out over the splendid bay of Maladroxia. It consists of a main building and an annexe, built respectively on four and two floors. The Lu’ Hotel Maladroxia is marked by its traditional ‘sea-faring’ style, which creates an atmosphere both welcoming and extremely relaxing. The 36 rooms of the Lu’ Hotel Maladroxia are divided between the two buildings composing the Hotel; they have free rapid Wi-Fi connection, AC and en-suite with shower. They may be set either on the ground or upper floors and differ as to area, the presence or lack of balconies, and the view. Some suites only may have separate rooms. The Hotel offers the availability of two rooms for disabled guests (one Classic and one Superior). The Plus rooms differ also as to style: here Mediterranean tradition blends with modern taste, while the other rooms are furnished in the Hotel’s traditional and sea-themed style. Classic, Classic Plus, Superior and Deluxe Sea View rooms: in the main building. Deluxe Plus, Junior Suite Plus and Suite Plus rooms: in the Annexe. The beach fronting the Lu’ Hotel Maladroxia is without doubt one of the most splendid on the Island of Sant’Antioco: it is known as “Maladroxia” and is just 70 m from the hotel. It has a fully equipped area with 30 deck chairs and 15 beach umbrellas, available with payment (cost starts at € 25.00 per day for one umbrella and two sun-beds). Cost of a beach towel is € 3.00 (each change has the same price). Near the Hotel, guests can practice several different sports activities: The Hotel’s staff will be happy to provide info and illustrate packages available. Sea sports are of course the most popular (diving, kitesurfing, snorkelling, deep sea fishing, sailing) but there is also a choice of on-land outdoor activities dedicated to the discovery of the surrounding area (trekking, mountain bike, horse-riding, trips in off-road vehicles and quad). Succulent regional, national and international dishes are on offer, with great attention to the freshness of ingredients and the quality of raw materials. Meals are served in the panoramic restaurant, which faces on to the spectacular Bay of Maladroxia. The American Bar, just a few steps from the pool and the sea, is the ideal spot for a quick lunch or a romantic evening meal. Both for lunch and evening meal, guests booking half board can choose from several tasting menus (surf/turf/vegetarian) all consisting of four courses, with table service. Guests booking breakfast only may choose, apart from breakfast, the à la carte alternative. Continental buffet-style breakfast – 08:00 – 10:30. Dinner - 20:30 – 22:00. The services offered free of charge by the Hotel include private car park (unattended), Wi-Fi available throughout the structure, an outdoor pool with hydromassage and a kids’ pool next to the main pool. The following services are charged: beach services, rental of beach towels, excursions and sports activities, visitors’ tax (€ 1.00 per person per day) small pets up to 7 kg weight, with vet’s certificate (costs start from € 7.5 per day – from mid-June to mid-September the cost is € 10.00 per day). Late check-out available on request, starting from € 50.00. Located on the ground floor or upper floors of the main building, they are furnished in a nautical style and have an interior view. Free Wi-Fi is available. Located on the ground floor or upper floors of the main building, they are furnished in a style that blends Mediterranean tradition and modern design and have an interior view. Free Wi-Fi is available. Located on the ground floor or upper floors of the main building, they are furnished in a nautical style and have a lateral sea view balcony. Free Wi-Fi is available. 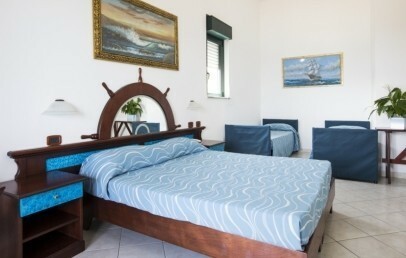 Located on the ground floor or upper floors of the main building, they are furnished in a nautical style and have a balcony with view over the Bay of Maladroxia. Free Wi-Fi is available. Located on the ground floor or on the first floor of the annexe building, they are furnished in a style that blends Mediterranean tradition and modern design and have an interior view. Free Wi-Fi is available. Located on the ground floor or on the first floor of the annexe building, they are furnished in a style that blends Mediterranean tradition and modern design. They have a stunning panoramic terrace, with view over the Bay of Maladroxia. Free Wi-Fi is available. The room is recommended for max 2 adults + 2 children (in sofa bed).